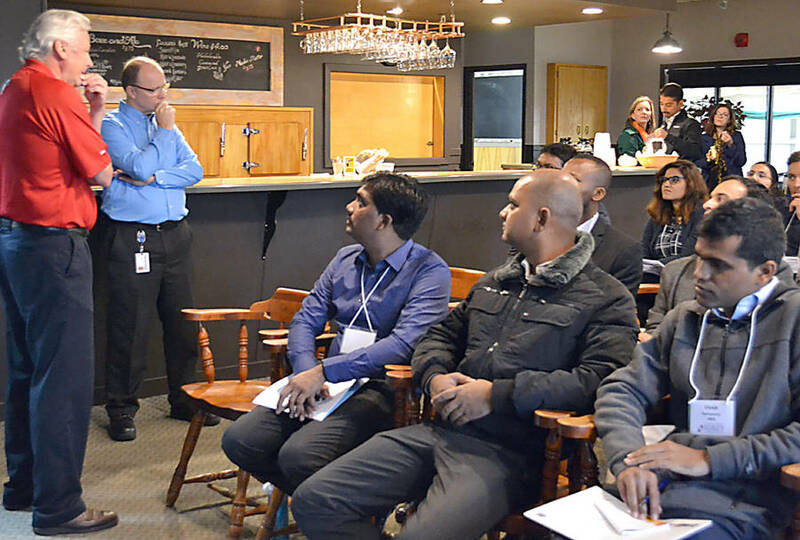 For 39 graduate students of the Sobey School of Business at Saint Mary's University the rubber hit the road in Halifax just after dawn on September 28. What followed was a full day of meetings with business leaders on the South Shore, part of a multi-business tour designed to discuss the opportunities the area offers. 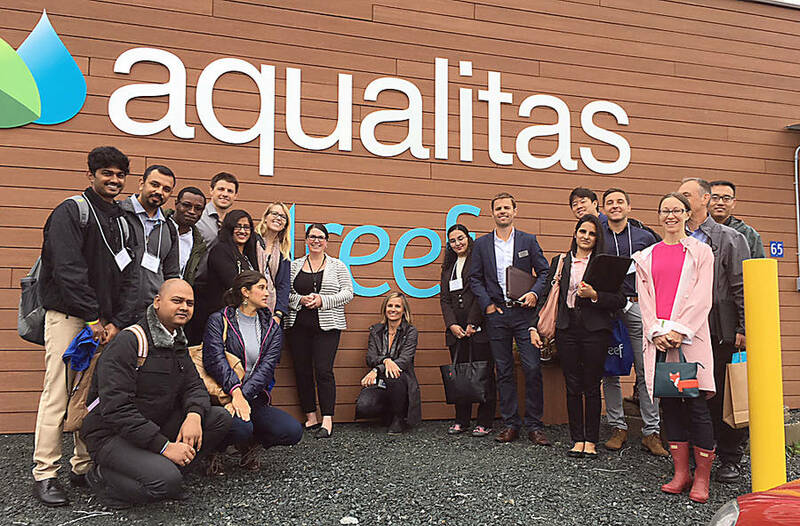 And for those international students who decided to join the group visiting Queens County's new cannabis producer, Aqualitas, it was "an eye-opener." The goal of the event was to showcase what the South Shore can offer from an employment perspective, "but also from the cultural perspective," according to Jim Key. One of the organizers of the tour, Key is an employer engagement specialist with the local Nova Scotia Works employment service centre. "We've all said it's not about bringing these graduates, masters students down here and have them all locate a job. It's about showing them that this is an option for them." Key suggests that often the international business students are so focused on their studies, they rarely venture beyond Halifax. And previous business tours had the students touring establishments in Ontario, not Nova Scotia. That changed last year when the school decided to have the students tour businesses in the province for the first time, partly as a response to the Ivany Report, which issued a clarion call about the need to develop the Nova Scotia economy. As Key puts it, the idea is to show the business students what the South Shore has to offer, "that Toronto can't." That sentiment is echoed by Dr. Harjeet Bhabra, the dean of the Sobey School of Business. "This tour is a direct expression of our commitment to making an impact on the prosperity of this province," the dean said in a press release. "At the same time, it helps our students build the ability to recognize opportunities that they otherwise might miss. And it helps connect the work of the university with more of the province." The session at Aqualitas drew almost half of the students, who lined up to provide identification documents to one of a number of security guards on site. 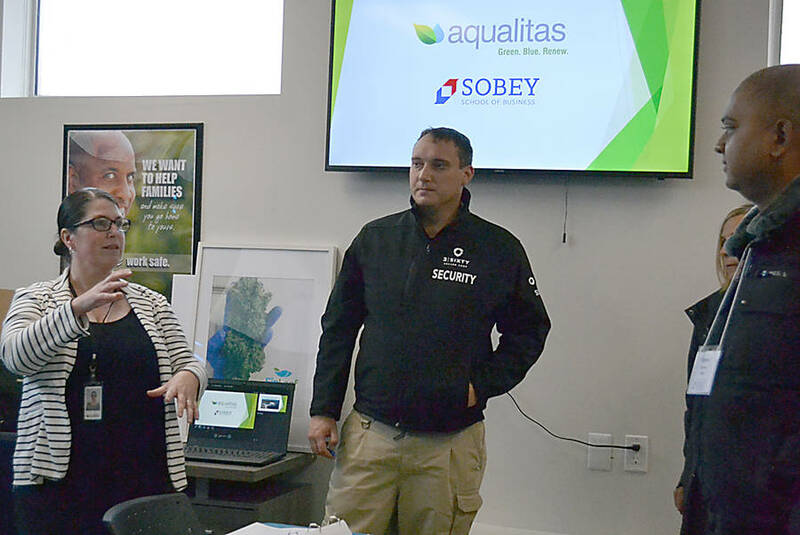 The information session there was led by Katharina Seitz-Cochrane, who is in charge of the company's international sales, and Aqualitas's communications manager, Nancy Stapleton. The two gave a general overview of company operations and where they see the organization headed in the countdown to cannabis becoming legal in Canada on October 17. Nishand Sharda, a student from India, said he found the tour "quite informative." He suggested it was an opportunity to see "a lot of new things which I haven't seen in my life." He noted that cannabis is banned in India, for example. "It's quite an eye-opener for me," he said of the stop at Aqualitas. Folasope Salami, a student from Nigeria, agreed, and commented that it was interesting learning about the innovative technology behind the cannabis production. "I think that's the key thing which is why I came for the tour. You only know as much as you see. "So I'm trying to see new things and learn something," he said. Salami said he would like to establish a consulting and design business in Nova Scotia. "Hopefully, maybe, over some time. Because I would like to definitely stay back. I enjoy the environment. I'm liking it here," said Salami. However, even if he has no choice but to go back to Nigeria, he says he would still like to be involved with the Canadian economy. "I feel like there's a lot of opportunities here," says Salami. The South Shore Tour is an initiative between South Shore businesses and Saint Mary's University. The university's Graduate Career Services office coordinates the tour. 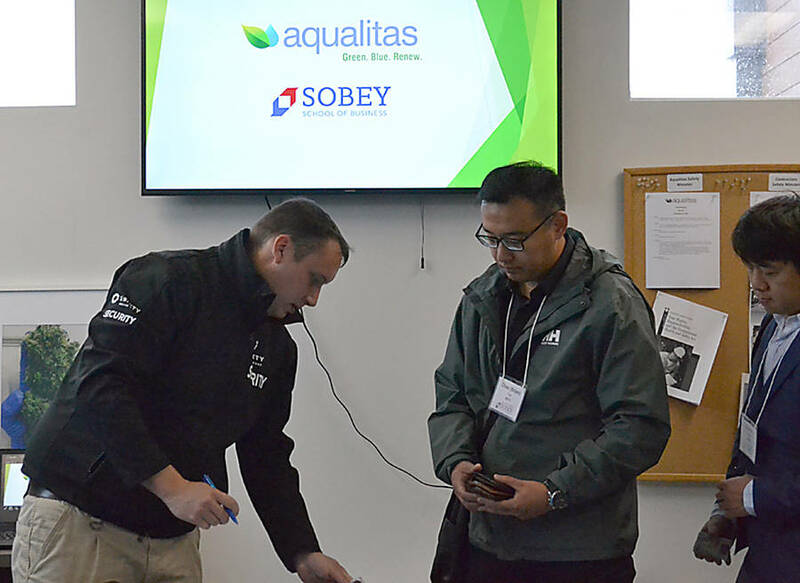 The event kicked off in the Michelin Social Club in Bridgewater, with an information session by Mike Mullally, personnel manager at Michelin's Bridgewater facility, and Joe Francoeur, Michelin's area personnel manager. Lunch was held at the Lunenburg County Lifestyle Centre, and the day wrapped up with a meet-and-greet event at Wile's Lake Farm Market.